Students, faculty, and staff were honored May 5 for their dedication and commitment to the College community at the 26th annual Aaron O. Hoff Awards ceremony. Sponsored by the Office of Student Leadership and Involvement, the awards are named in honor of one of the College’s first students. In 1832, Hoff blew the horn that summoned Lafayette’s first 43 students and three teachers to class. As a member of the Class of 1836, Hoff was the College’s first African American student. View more images of the ceremony on Flickr. 1974 Award. 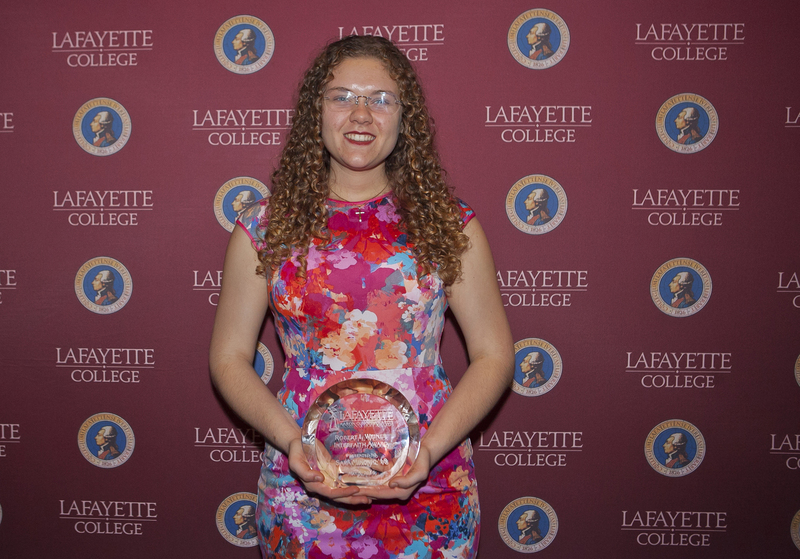 This award recognizes the student who most exemplifies the groundbreaking spirit of the first class of women to graduate from Lafayette College by working toward equality for women on campus. Sara Mikovic ’18 receives the Robert I. Weiner Interfaith Award. The World Citizen Award. This award recognizes the student who has demonstrated commitment to international or global issues through academic work or co-curricular leadership at Lafayette College. Mattachine Award. This award recognizes the student who most exemplifies the courage of the Mattachine Society, the nation’s first LGBTQ rights organization, in working tirelessly to advance LGBTQ rights at Lafayette College. Robert I. Weiner Interfaith Award. This award recognizes the student who contributed most significantly to interfaith work by promoting constructive dialogue between religious and intercultural groups on campus. Frances Ocansey-Ahene Spirit of Multiculturalism Award. This award recognizes a graduating senior whose commitment to academic excellence and inclusive leadership within the community transcends all barriers and exemplifies the ethos of multiculturalism at Lafayette College. Big 8 Program of the Year Award. This award recognizes the individual or group who planned and implemented the program or initiative that most impacted the campus community in its emphasis on cross-cultural dialogue, intellectual exploration of a sociocultural issue, and/or social integration across identities. New Student Organization of the Year Award. This award recognizes a student organization new to the campus in the current academic year. The organization will demonstrate a progression of growth throughout the year as indicated by their programming and membership. 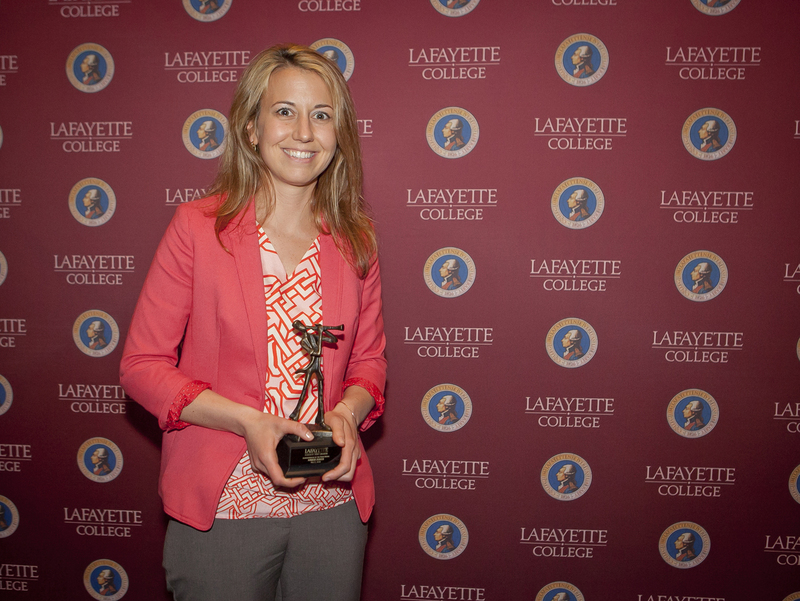 Along with fostering personal and professional excellence in its members, the organization will have had an impact on the Lafayette community. The Commitment to Service Award goes to Delta Kappa Epsilon. Greatest Strides Award. This award recognizes a student organization that has demonstrated an evident amount of improvement in varied student organization management affairs. 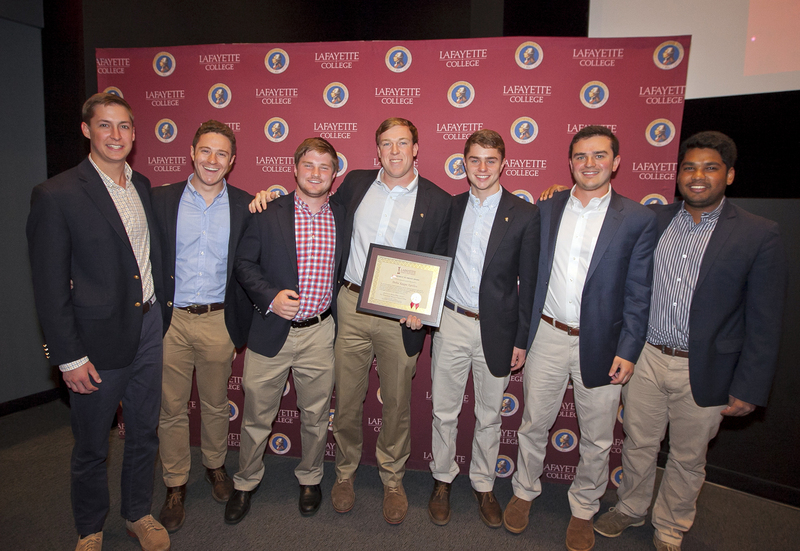 The student organization recognized will have made significant contributions to the Lafayette community while experiencing an intentional focus and development toward reaching new heights as a student organization. Commitment to Service Award. This award recognizes a student organization that has displayed significant effort for the improvement of the Lafayette campus through philanthropy. This group will have inspired and motivated others to act philanthropically, and exemplified leadership and integrity in all words and actions while also having made a meaningful contribution to Lafayette through philanthropy. Service Above Self Award. This award recognizes a recipient who best exemplifies the qualities of caring and concern for others through participation in service activities. This active citizen is committed to discovering the root cause of social issues and supports solution-based initiatives with significant amounts of personal time. Residential Spirit Award. This award recognizes a student who has gone above and beyond to make connections in their residential community. This individual has fostered relationships amongst students on the floor, building and/or Commons and acted as a support system for fellow residents; participated in community events, initiated and/or encouraged others to participate in hall or campus activities; modeled community standards and encouraged others to do the same. Superior Teaching Award – Humanities and Social Sciences. This award recognizes a professor in the humanities or social sciences divisions who serves as an exemplary scholar by teaching above and beyond the required level and having a significant positive impact on the careers of students inside and outside of the classroom. Amber Zuber is the Administrator of the Year. Superior Teaching Award – Sciences and Engineering. This award recognizes a professor in the sciences or engineering divisions who serves as an exemplary scholar by teaching above and beyond the required level and having a significant positive impact on the careers of students inside and outside of the classroom. John T. McCartney Excellence in Diversity Education Award. This award recognizes a faculty member who demonstrates intellectual passion, mentorship of students, and a strong commitment to diversity. The successful recipient inspires high academic achievement in her or his students and promotes cultural awareness for the campus community. Administrator of the Year Award. This award recognizes a Lafayette administrator who has demonstrated dedication, availability, and energy in their involvement with students. They should be valued and respected by the students with whom they work and have a strong understanding of students’ needs and goals. They should have a strong educational role, produced meaningful change and helped students learn through their involvement. Staff Member of the Year Award. 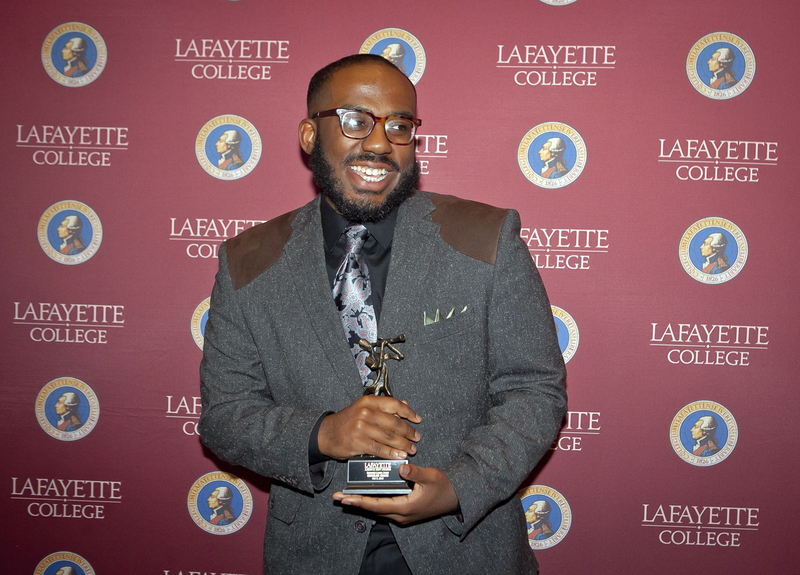 This award recognizes a staff member who has served the Lafayette community going above and beyond their responsibilities of the position, has been courteous and engaging with students, and has improved the quality of campus life. Charles Evans ’19 receives the Emerging Leader Award. Marquis Award. This award recognizes exemplary leadership by either an individual or an organization. The recipient has influenced the behaviors, actions or opinions of others toward a common goal or purpose. Progress toward (or accomplishment of) the goal resulted in the betterment of the student body, the College, and/or the surrounding community. Decisions about determining a goal or direction, were evidence-based. The recipient models collaboration, handles controversy with civility, and places value on a common purpose. Emerging Leader Award. This award recognizes a student who demonstrates considerable leadership potential and has made an impressive transition from exploring to taking the lead toward meaningful change. Decisions about why or how to change were based on an evidence-based need. The recipient displays consciousness of self, commitment, and values congruence.